Flame Retardant Balanced Blowers with the exclusive Free-Air Chamber for Quiet Power! 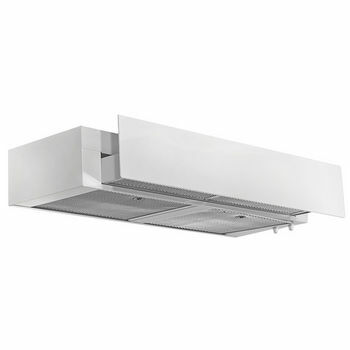 Wall Mounted range hoods/ Flush mounted 3000 series range hoods equipped with centrifugal blower which enables quiet smooth operation and high power perfomance. 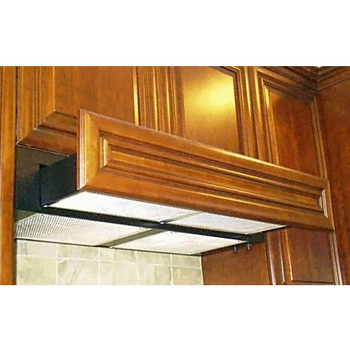 Wall Mounted rangehoods are in white or black powder coat finish. Also available in custom size. Very well made and relatively easy to install. One of the mounting bolts supplied was too short, but a trip to the hardware store fixed that. Grounding terminal could have been better designed or some hardware provided. Fan is relative quiet for a unit of this size class and exhaust flow is as expected. Dimmer with LED bulbs works fine and is a bonus. Would definitely buy product again. Was just what we were looking for in our new remodel. Fairly quite fan and the pullout feature is nice. Haven't installed it yet but just going by delivery and appearance of the range itself, we love it. I ordered the white wood panel ready and it arrived fast and in perfect condition. I love the fact that it was double boxed. I can hardly wait until we receive our custom cabinets and the panel for the range and can install everything, it's going to look great! thanks! 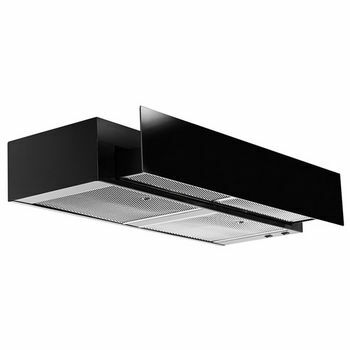 This has to be one of the best range hoods that I have looked for and purchased. Its' looks are very deceiving when you pull it out of the box. Very simple features and for the power of the fan, very smooth and quiet. The only problem with installation was getting the old hood out. Thank you for such a great product. I like being able to close the fan to cabinet depth. The fan noise is OK but my motor has a noise that is to loud. I don't know if this is a faulty motor or not. The lighting could be better. It is not very bright enough but I like the rheostat on the light and fan. 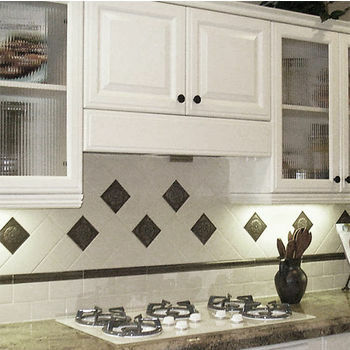 Finishes off the kitchen perfectly--no unmatched hood range sticking out from under the cabinet. A little tricky installing it, but totally worth it. Just wanted to let you know that we received our Range Hood just the other day. THANK YOU for the Great Service. We really appreciate the speedy expedite. Now, keep your fingers crossed that everything will go right into place when this is installed!! It really blends into the kitchen and improves the look. If I could improve it I'd try to make it a little quieter if that were possible. But it is a powerful vent, so that may not be possible. 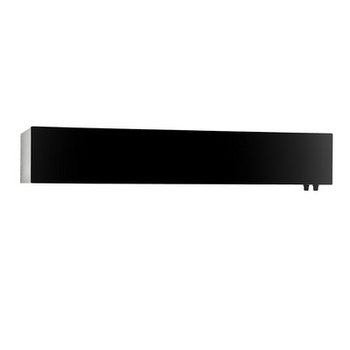 For item IM-G3048SD4-SS you would need to manually pull the drawer in and out for usage. To turn the fan or lights on and off, there is a knob which would be located on the right hand side of the unit allowing you to choose your function option. You would need to purchase the 7" duct separately, found here: Click here - hardware stores should also carry a similar item that could be used. The slide-out has a depth of 11-3/4" in the closed position. The SD2 & SD4 extends out 5-1/2" on SD4 and SD2 models for a total depth of 17-3/4, while the PS1 model extends out 10" for a total depth of 21-3/4. It comes in your choice of a stainless steel front panel, a pre-painted white or black front panel, or a wood-front ready where you would supply your own wood front panel. How does this work? - You have to pull the unit out 1" or more for the motor to run. When you are determining the proper amount of CFM’s you will require for your blower, you need to determine how many BTU’s your cook top gives off. 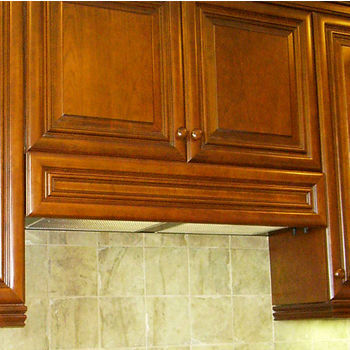 It is important to have the correct amount so that your range hood will be effective. 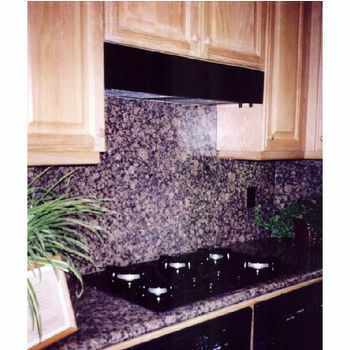 Each burner will give off a different amount of BTU’s; the information should be in the manual for your stove top, or you may be able to research the information online with your stoves make and model. You can view the specs of this item at Click here . 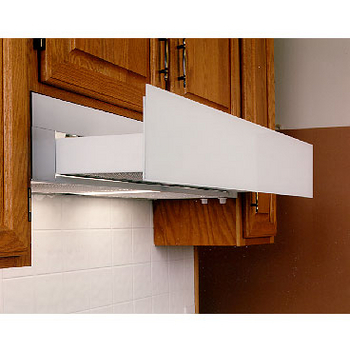 The depth of the box that goes under the cabinet is 11-3/4"D. The front face extends 10". The unit has to be open at least an 1” to work. The height on model number IM-G3030SD2-SS is 6-1/8" H.
To make the hood ductless, purchase the Recirculating Kit (IM-36NV-KIT)’ by scrolling down to the ‘Optional Accessories’ on the Hood page. 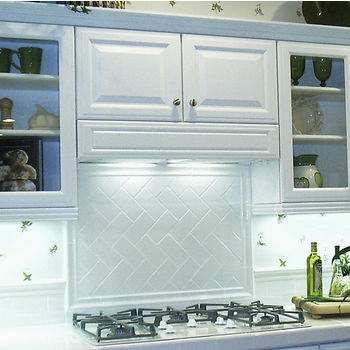 Though, the wattage can be less than 75W, this hood is only accepts Incandescent bulbs. LED Lights are not compatible. 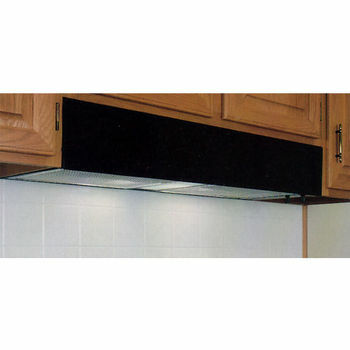 Range Hoods have two blower types. The first is a Centrifugal or Squirrel Cage Blower which has a more powerful CFM and is less noisy but more expensive. The other option is an Air Ring Fan also, known as a fan blade or rotary, it discharges horizontally and is noisier, more reasonably priced, but less efficient. If you call our 1-887-6721 number, our customer service team can walk you through finding the best hood for your needs. 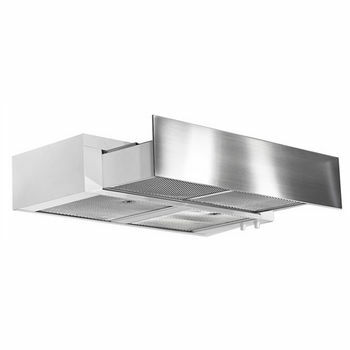 The Range Hood has to be open about 1’’ in order for the fan to operate. Yes, this is a vented unit. If you cannot duct, it has a ductless option which you would purchase separately. The SD2 and SD4 models are the only ones that can use an NV (recirculating kit). If you choose to at a later date change from a stainless steel panel to wood front, a new drawer would need to be purchased from us. 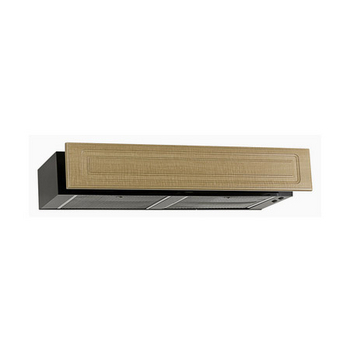 The wood panel is supplied by a cabinet maker and is not included when ordering this hood. 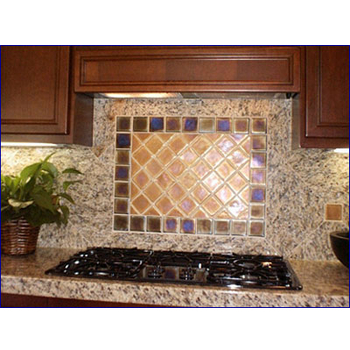 Pricing is deterrent on selection of Wood, Painted or Stainless Front Panel. On the SD model the closed drawer depth is 12" . 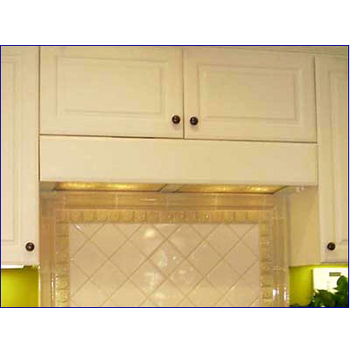 The IM-G3042sd2 is a cabinet mount hood which attaches up to the top of the cabinet. So yes, that should work for you.